How to Fix “Windows Defender Alert” Scam? Home »	Fix » How to Fix “Windows Defender Alert” Scam? Issue: How to Fix “Windows Defender Alert” Scam? Yesterday I’ve started getting an alert, which claims that Windows Defender detected Zeus virus. It would seem rather convincing, except that it’s displayed while I browse with Chrome. Besides, I was not able to close the window with the Windows Defender Alert, so I had to close web browser entirely. Should I worry about Zeus or another virus infection? Why am I seeing the “Windows Defender Alert” pop-up? 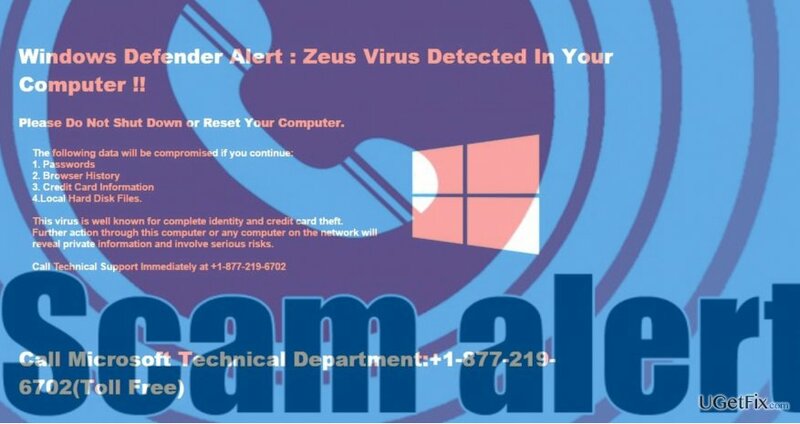 “Windows Defender Alert: Zeus Virus Detected In Your Computer” pop-up is generated on a web browser that the PC owner is currently using as default. Although the warning seems to be official, it is not related to the condition of your PC and Windows Defender so far. The “Windows Defender Alert” is a Tech-Support-Scam, which is triggered by a corrupted web domain to which your web browser was redirected after clicking on a malicious link or a potentially unwanted program, namely adware. Scammers distribute warnings like “Windows Defender Alert” pop-up to scare people into thinking that their PCs are infected and seek to convince them that the only reliable solution is to call for Technical Support by dialing the given telephone number. However, any contact with the scammers may lead to serious issues, including identity theft or money loss. If your web browser is currently locked with the Windows Defender Alert Scam, you will have to terminate your web browser using Task Manager and then apply some fixes to prevent the alert from getting back again. 1. Press Ctrl + Alt + Del and open Task Manager. 2. Find Google Chrome process, click it, and select End Task. If your web browser generated Windows Defender scam alert because you have accessed the compromised website, make sure not to restore the last browsing session and be more careful when clicking on doubtful ads and links. Moreover, strengthen your virtual security by ensure that the antivirus you are running has the latest definitions and real-time protection enabled. 1. Boot Windows into Safe Mode. 4. Now right-click on Windows key and open Control Panel. 5. Select Programs and Features. 6. Remove applications that look suspicious or you are not familiar with. To do so, click on the app and select Uninstall. 7. Finally, reset Google Chrome's default settings. To start with, open Google Chrome. 8. Press on the menu icon and open Settings. 9. Click on Show advanced Settings option and navigate to Reset Settings. 10. Click Reset on the confirmation window and the restart Chrome.